Among the first things you should do after deploying Windows at Open Hosting is enable our platform firewall and enable Microsoft Remote Desktop. Both the Open Hosting platform and Windows 2008 have their own firewalls, which are controlled independently. Our firewall is optional, but highly recommended, especially with Windows. Theirs is standard. Another key difference is that our firewall is implemented at the platform-level, which mean traffic is blocked before it contacts your server. With the server shut down, go to the Server Configuration page and enable Firewall. Specify the ports to open in a space-separated list as “[transport]/[port number]“. 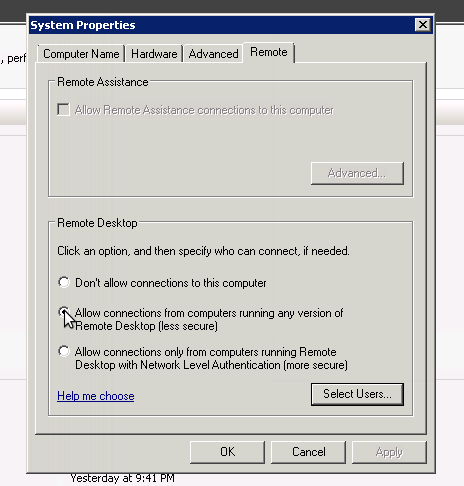 For our purposes, you’ll enter “tcp/3389″ to open TCP port 3389, which is the default port for Remote Desktop Protocol.? Save your changes, and start the server. Use VNC and connect to the server. 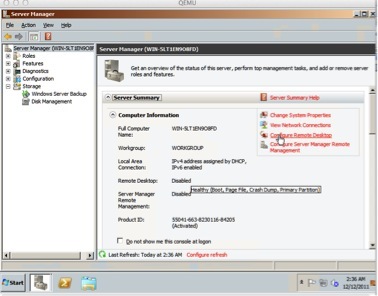 Start the Server Manager (right-click on My Computer and click Manage). Select an option and configure users, if needed. The second option, “Allow connection from computers…” has the benefit of supporting Linux-based clients like, Remmina.